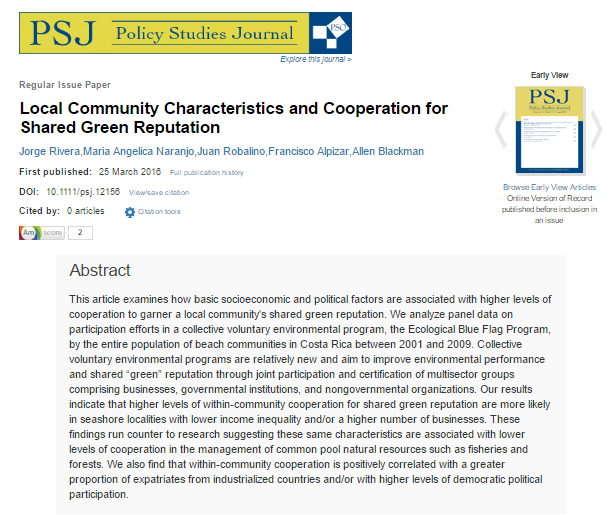 This article examines how basic socioeconomic and political factors are associated with higher levels of cooperation to garner a local community's shared green reputation. We analyze panel data on participation efforts in a collective voluntary environmental program, the Ecological Blue Flag Program, by the entire population of beach communities in Costa Rica between 2001 and 2009. Collective voluntary environmental programs are relatively new and aim to improve environmental performance and shared “green” reputation through joint participation and certification of multisector groups comprising businesses, governmental institutions, and nongovernmental organizations. Our results indicate that higher levels of within-community cooperation for shared green reputation are more likely in seashore localities with lower income inequality and/or a higher number of businesses. These findings run counter to research suggesting these same characteristics are associated with lower levels of cooperation in the management of common pool natural resources such as fisheries and forests. We also find that within-community cooperation is positively correlated with a greater proportion of expatriates from industrialized countries and/or with higher levels of democratic political participation.